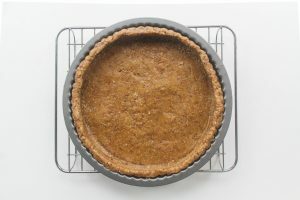 A deliciously nutty crust ! Why should we include walnuts into our diet? Unlike almond and peanut butter which can easily be found, it is very unusual to come across walnut butter! This is very unfortunate since it yields an array of health benefits! Walnuts are rich in omega-3 fatty acids which contributes to a healthy heart among many other benefits! A handful of walnuts will make your sugar craving disappear like magic and will keep you satisfied until your next meal! I blended the walnuts until they reached a sticky consistency, almost like a butter. I mixed them with the oats, added 2 tbsp. of maple syrup, 1 tbsp. of coconut oil and some vanilla extract, flaxseeds and salt. Et voila! It really is that simple! 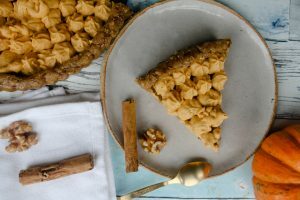 The filling is as simple and easy to make too! 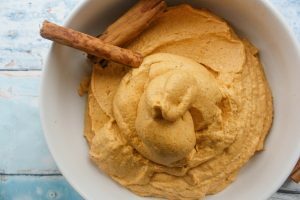 If you are lucky enough to have a garden with beautiful pumpkins, then turn them into a puree! 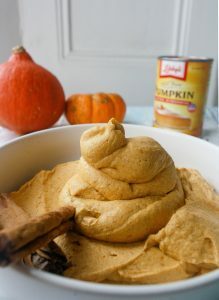 Otherwise a can of pumpkin puree will do perfectly, all you need to ensure is that no other ingredients have been added! How did I get such a smooth and sweet pumpkin filling you ask!? 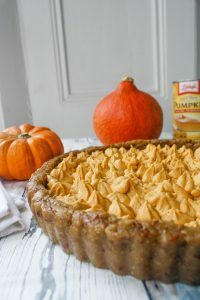 The secret of this filling is the addition of the coconut whipped cream! 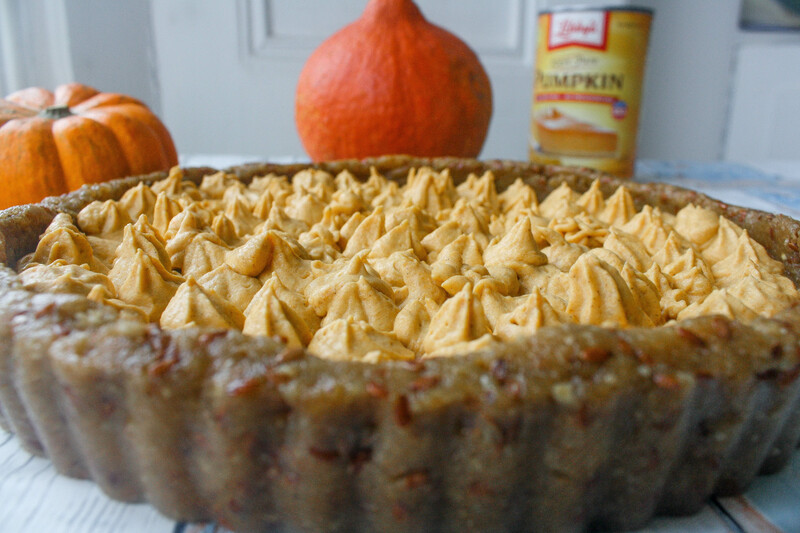 Pumpkin puree + Coconut whipped cream = The most delicious Vegan & Creamy Pumpkin Filling! 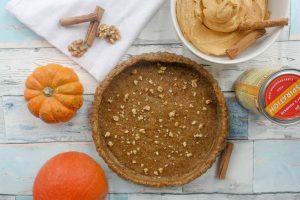 This raw tart is so satisfying, you don’t need to be vegan to enjoy it! 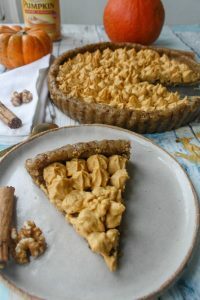 Your friends and family, or anyone you want to share it with, will be astonished once they hear that this delicious Raw & Creamy Spiced Pumpkin Tart contains absolutely no dairy! 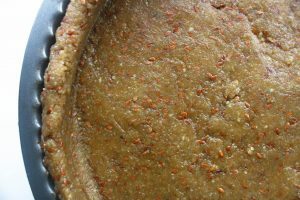 First, place the walnuts in your food processor and blend until the nuts are finely ground, between a flour and a nut butter. Then add the oats. Once those have been mixed, add the rest of the ingredients and mix until it becomes a sticky dough. Press the dough evenly onto the base, cover with cling film and leave in the fridge for 1 hour. Next, add the pumpkin puree, cinnamon and nutmeg powder. Whish until all ingredients are well combined into the coconut cream. 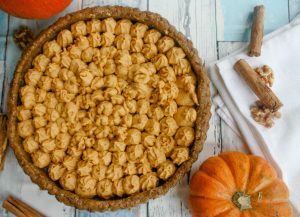 Fill a pastry bag with the pumpkin filling and pipe the mixture onto the tart (you can also simply use a spoon for a more rustic look! ).